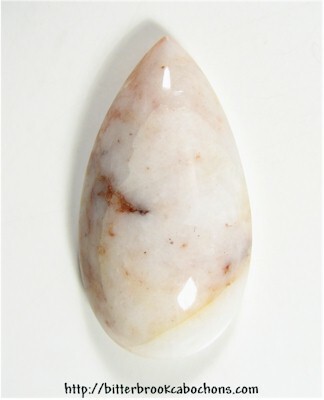 Unremarkable but large white Brookwood Stone cabochon. There is some reddish coloring along the left side, and what appears a remarkably stark coloring change at lower right is an area filled with tiny chatoyant sparkles; they reflected the photographer's light a LOT and look whiter in the photo than they actually are. 37mm x 21mm x 9mm. Weight: 47.15 carats.